Twenty-four year old Lina Berg was a breath of fresh air as she breezed into the castings for Chloé Resort 2015 held in New York by Elodie Yelmani Casting. The Berlin native's head-to-toe black outfit paired with Doc Martins were the perfect counter-balance to Berg's flaxen golden hair, lightly bleached eyebrows, and flawless fair complexion. Berg's strikingly angular bone structure, intense gaze, and compelling mix of femininity and androgynous cool, make her impossible to miss amongst any casting line-up. However it is Berg's personal backstory and character which make her more than just another pretty face and instead someone that you would want to kick back with over a beer and get to know. A former student of math and physiques, Berg's interest in people and what drives human behaviour may be attributed to her mother who is a practising psychologist. Within five seconds of entering the casting room, Berg had casting director Elodie Yelmani and IMA in the palm of her hand with her engaging personality, natural ease, and wicked Berliner humour. Modelling for only two years, Berg's stint in New York during the Resort 2015 collections has catapulted her well and truly into the fashion limelight. Blue chip appearances at Calvin Klein, Balenciaga, Chloé, and Miu Miu, have industry heavyweights hailing Berg as the new Iselin Steiro. With her slender 178 cm silhouette, a chiseled jawline and spectacular cheekbones, and a runway death stare the would make grown men weep, Berg was a commanding presence as she stalked the catwalk for the fashion elite. Berg's recent test shoots with Matthew Priestley and William Lords, and editorial bookings for Vanidad, XOXO, and i-D, are a prelude to what will surely be a killer Spring/Summer 2015 season. Berg caught up with IMA while recharging her batteries in the lead up to Fashion Week, to discuss her love of travelling, the duality between modelling and acting, the importance of keeping an open mind, and her most cherished Resort 2015 moments. Inoubliable Model Army (IMA): Hi Lina, thank you for chatting with IMA! Super congrats are in order for a stunning debut at the Resort 2015 collections with appearances at Chloé, Calvin Klein, Balenciaga, Miu Miu, and Opening Ceremony. How are you feeling in the aftermath of the Resort 2015 shows? Lina Spangenberg (LS): Hey hey, thank you so much for your congrats and this interview! I'm super excited about how my debut in New York turned out. I really didn't expect it to be that amazing! Before I came to New York, I thought I will just enjoy the new city and build up my book a little ;-). But I guess unexpected things are always the best and you can enjoy them even more! IMA: Would you mind filling in IMA's audience on your personal backstory? LS: Of course! I'm 24 years old and come from Berlin. I first started modelling almost two years ago but really started travelling around one year ago when I first met Tuomas Ahonen, my lovely booker from M4 Models, my mother agency. IMA: When we met at the castings for Chloé Resort 2015, IMA was struck by your composure, quiet confidence, and natural charisma. Do you find the casting process nerve-wracking and how do you approach castings in general? LS: I like doing castings, every time and again it's interesting how clients react, what they want you to do and most importantly it's always a new chance ;-). I don't think a lot about castings beforehand. I just walk in and be myself. The only preparation that is important for me is to do sports (I love to go running to free my mind) whenever I can, to eat healthy and drink lots of water. Also getting a good night's rest is important to feel fresh and full of vitality. IMA: Given that you've been modelling for some time already, what factors do you feel have fallen into place recently to allow for you to finally breakthrough to modelling's elite level? IMA: You're a fellow Berliner! IMA was based in Berlin for three years and loved it there. What do you love and miss most about your home city and what have been your impressions so far of New York? LS: Right now everything is so new and interesting here in NYC so I haven't reached the point of missing Berlin yet. I have always been a person who wanted to discover the world and not stay in one place for too long. Travelling has always been a part of my life, as my parents went on holidays a few times a year with me and my younger brother. Through the way I was raised, I guess I grew up to be an independent and strong person so homesickness and self-crisis haven't touched me yet, at least for now ;-). The only thing that I will miss for sure is my friends and my cute little apartment in which I don't have to fight with "little monsters" who leave dirty dishes all over the place and steal my underwear, haha! 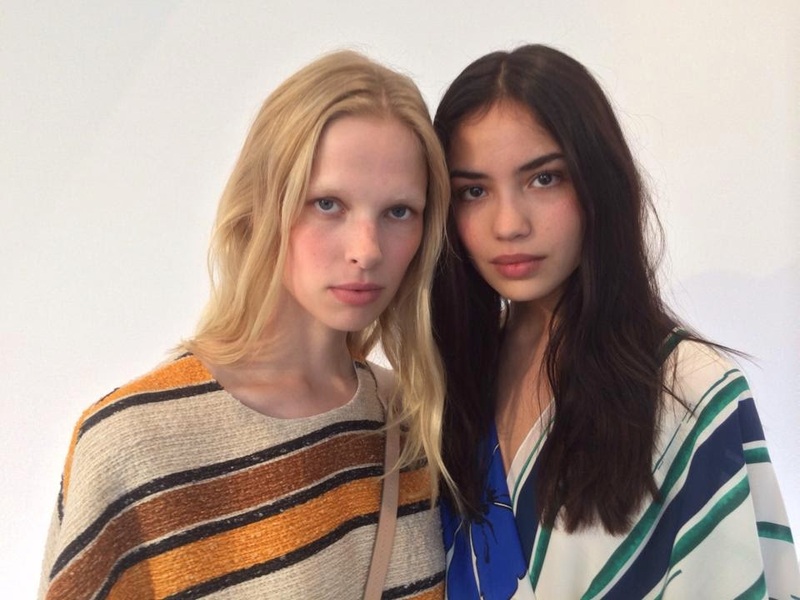 IMA: Backstage at the Chloé Resort 2015 Presentation, you mentioned that you had a studying background in economics and physiques acquired at the University of Dusseldorf! What were your career aspirations before modelling interceded and what have you found most surprising about modelling and the industry itself? LS: I actually studied maths and physics. My original plan was to study psychology but then things didn't quite work out the way I was hoping. Most surprisingly was perhaps my own feelings that it felt so natural and good to pose for a camera and to walk down a catwalk. IMA: You've appeared in stunning editorials for i-D, Bullett Magazine, Vanidad, and XOXO Magazine, and recently tested with photographers Matthew Priestley and William Lords. Do you enjoy the print component of modelling and are you able to feel the moment on set when all the factors are perfectly aligned to produce a killer image? LS: To create a killer image, it's super important that the teamwork is good and everyone is giving 100%. If that's the case and there is some cool music playing, I love the Stones but also funky 80s music or 90s hiphop. It's fun becoming a different character in front of the camera. I love to develop new characters, for me there are no rules once I am in front of the camera, I just want to let go and strike a pose ;-). The other day when I was on set, I received the biggest compliment when someone said, "Lina you are an actress! ", I loved hearing that because for me this is also an integral part of my job. IMA: In terms of recent casting trends, there appears to be a level playing field with models of all nationalities converging on fashion's runways. Casting directors are looking instead for girls with personality and a distinct individuality more akin to the supermodel aesthetic of the early nineties. What are your thoughts on this casting trend and do you feel that the current generation rising stars have what it takes to inject the Super back into modelling? LS: I think the supermodel era was a time unto itself but it's great to see that clients like to book models with character again. IMA: A model's sense of style plays a key role when presenting to clients and also off-duty due to the rise of street style photographers and bloggers. How would you describe your own personal style and what are your current wardrobe essentials? LS: I would describe my style as easy and comfortable. I love to combine black basics with some more outstanding pieces like colourful shoes or other accessories. I couldn't be without my black skinny jeans, doc martens, and a cool jacket. IMA: Travelling is part and parcel of a model's daily existence. What have been some of your favourite travel destinations and would you mind sharing some insider Berliner travel tips? LS: New York would definitely rate as one of the tops but I also loved being in Istanbul a lot, the city is so inspiring and different. I had some great shooting locations, beaches, dessert, and I really found the different cultural aspects interesting. When you go to Berlin you should simply hangout in the streets of Kreuzberg. There you can find everything; restaurants, bars, parks, exhibitions, you name it! IMA: Management plays a vital role in a model's career trajectory. How has your agency Fusion Models NYC prepared you for the New York market and what do you value most about Fusion's management philosophy? LS: That is so true. I am super happy to be placed with Fusion in New York. They are a boutique agency so not too big and they do care a lot about every single model, and give me the feeling that they are interested in me as a person! LS: That I just have to be open-minded towards new people and situations and that I will benefit a lot even from bad experiences. You just have to try to enjoy every single second and what each different market has to offer. Being able to see the world isn't something everybody gets to enjoy with their jobs. "Don't think about everything" that was something I had to learn in the beginning. IMA: What were some of the key highlights of the Resort 2015 collections that you will cherish forever? LS: There are a lot of things I will never forget about. First of all to meet the designers, who I only knew from press and the internet beforehand. The way Alexander Wang welcomed me backstage was amazing, he is super nice with a cute character and handsome ;-). At all of the shows the work backstage was super professional, well organised, I met some people again who I haven't seen in a while like other models but also Duffy, the famous hairstylist who I knew form Berlin. Really crazy to me was the way I got to meet the "Chloé Family", everyone welcomed me with open arms (including you) and I even got invited to the official dinner after the show. That was a huge honour for me! Thank you so much!! LS: That I am just myself, a bit quirky and strange sometimes, an honest character with a lot of thoughts and talent to inspire others. Well, when it comes to my appearance, people tell me that they love my hair colour and structure, my deep expression in the eyes, and the easy and delicate way I move my body. I really enjoy meeting new people and I look forward to each adventure.